You are at:Home»News»Live at Leeds 2018 announce Pulled Apart By Horses, Ash, The Magic Gang and many more! 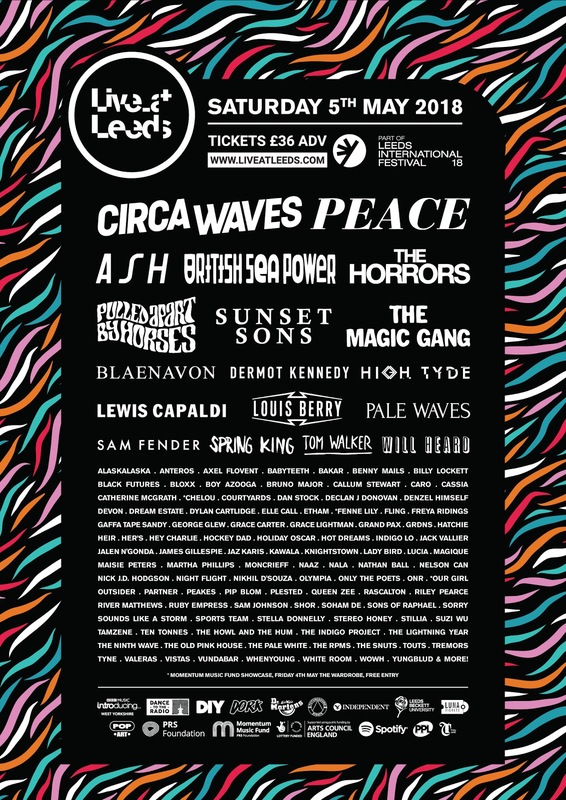 Live at Leeds 2018 announce Pulled Apart By Horses, Ash, The Magic Gang and many more! As 2018’s festival season draws ever closer, Live At Leeds is once again standing as the ultimate destination to hear the very best in new music and stunning live favourites – adding a huge raft of names from across the musical landscape. One of the most acclaimed new guitar bands of recent times, The Magic Gang have become unrivalled leaders of soaring indie anthems. Triggering singalongs no matter where they go, the Brighton natives have burst their way into hearts with the likes of ‘Alright’, ‘All This Way’ and ‘Jasmine’ as a band born for huge live moments. With their debut album set to emerge this year, their appearance at Live At Leeds is primed to be the crowning of future indie royalty, and sure to be one of the most talked about sets of the day. Not only bringing the essential sounds for the year ahead to the city, but also championing the thriving music scene that flows through its streets, Live At Leeds 2018 sees one of its adored favourites return in the shape of Pulled Apart By Horses. Packed with a menacing punch of garage-rock fever, they’ve become renowned for adrenaline-fused live shows and an uncompromising ability to have crowds in the palm of their hands in no time. With 2018 marking 10 years together as a band, expect Pulled Apart By Horses set at Live At Leeds 2018 to be nothing short of unmissable. With equally huge choruses to boot, 90s heroes Ash are sure to bring a tour-de-force of infectious hits from across their storied career. Expect ‘Girl From Mars’, ‘Goldfinger’ and ‘Shining Light’ to erupt crowds when their phenomenal live show rolls into Live At Leeds 2018. Packed with thrilling new names, Live At Leeds is a coming together of the most anticipated emerging talent you’ll be hearing talked about again and again in 2018 and beyond. Bound for a huge year ahead, Ten Tonnes will bring his vibrant and punchy garage hooks to the city, likewise Liverpool’s own Louis Berry is set for a defining Live At Leeds moment when his rockabilly charms take over the city, with London’s alt-guitar buzzers Sorry set to continue their talked-about rise with a set that pushes the boundaries of what a guitar band can be in 2018. Frantic energy and glorious pandemonium are guaranteed with Doncaster’s Yungblud, swooning dream-pop will light the way with Her’s and the eclectic musical blendings of Alaskalaska will leave your jaw firmly on the floor – all serving up invigorating and talked-about sets from bands tuly thriving in original flavours. Across the city, Live At Leeds 2018 is crammed with sensational sounds from across the musical spectrum. From the swooning country croons of Catherine McGrath, the unmistakable punk-showmanship of Sports Team and the hypnotic tones of Grace Lightman to the snarling visceral ferocity of TOUTS, the lo-fi fuzz of Stella Donnelly and the gritty glam-soaked tide of The Ninth Wave – there’s always something new and different around every corner. Beach hooks are bound to land in style when Sunset Sons return to Live At Leeds, with hip-hop morpher Denzel Himself, Dutch favourites Pip Blom, anthemic songwriter Dermot Kennedy, art-rock newcomers Caro, the raw emotions of Bruno Major and Kent trio Lady Bird all set to kick off their summer at Live At Leeds. With the likes of Nelson Can, LUCIA, Queen Zee, Fling and many more also announced, Live At Leeds 2018 is the only place to go to find your next favourite act. “Live at Leeds gives us a brilliant line up year after year, to be a part of it is an honour. Especially excited to catch The Horrors”. These names join an already stunning bill leading the way in new music and future superstars, from returning game-changers such as Circa Waves, Peace and The Horrors to trailblazing new favourites such as Pale Waves, Blaenavon, Spring King, Anteros, Lewis Capaldi, Tom Walker, Sam Fender, Will Heard, Grace Carter, Boy Azooga, whenyoung, Bloxx and many more – Live At Leeds is the celebration of new music that 2018 needs, and the first place to hear the essential sounds it has to offer.